There are lots of sites out there for sending e-cards, but Treat.com is different. You can send real paper cards that are personalized with your own photos, for the same price as buying a card at the store and putting a stamp on it. How cool is that? I searched the Valentine’s Day Cards today and found some really special ones for some people we love so much. The site also has tons of add-ons (gift cards and Photo Gifts ) you can send for bigger occasions or just for fun! All of the text is editable and I think you can customize layouts a bit too, but I didn't play with that because they were great the way they were. Want a sneak peek of some of the cards I made? Such a cool service! I love that they have "card club" packages too, where you can pre-buy certain numbers of cards in order to get a lower price on them. You can schedule cards to go out, ahead of time, so you won't forget anything. 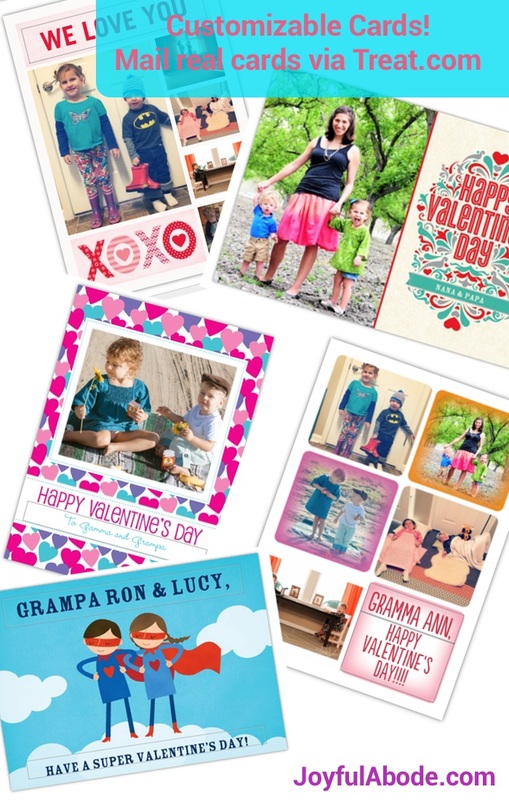 Order your cards with code SENDMORELOVE by 11am Pacific on 2/10/14 to get them in time for Valentine’s Day. With the code, you can order 3 cards for only $6! Mail all 3 to yourself to deliver in-person, or direct to each recipient for the price of a stamp. So…. who do you know who deserves a card from Treat? I love this idea! The personalization really makes them special, I will definitely be checking these out! Thanks for introducing this to me! I am currently deployed and was fretting about cards not getting back to the states in time for birthdays, ect. I am so excited to design my cards. Wow that will be so helpful for you! I know it took aaaaaages whenever my haubans wanted to send us a letter when he was deployed.